This story originally aired on Southwest Florida’s WINK News on April 2, 2019. Reporter, Jerrica Valtierra; Writer, Derrick Shaw. Imagine the feeling of pride to see your product on store shelves. 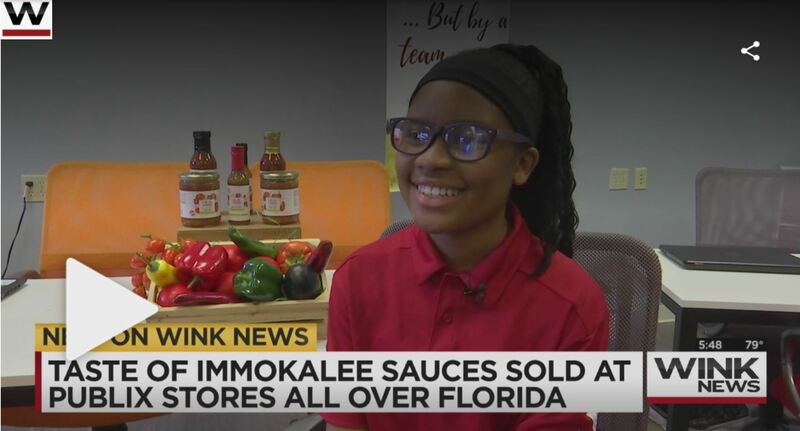 That’s what Immokalee High School and college students felt when they found out their sauces will be sold at Publix stores all over Florida. The Taste of Immokalee is a youth entrepreneurship program that gives students real business and entrepreneur experience. “Taste of Immokalee” is packed at a plant in Central Florida, with produce from Lipman Farms in Immokalee. The salsa, hot sauce, and BBQ sauce will soon be found in 200 Publix stores. The recipes come from the kids themselves, after listening to feedback from customers and brainstorming themselves based on what they like in their salsa. And the money made ends up coming back to Immokalee and used to educate students in the program. Watch the full story on WINK News to hear interviews form students in the program.